Friday, April 12 at 7:30 PM! That’s when the Nyack College School of Music will headline a concert, “Yesterday, Today, Forever,” on the stage of David Geffen Hall, Lincoln Center located at Columbus Avenue and 65th Street in Manhattan. Featured Nyack performers include the Chorale accompanied by the String Orchestra, the Gospel Choir, Purpose and the Jazz Ensemble. 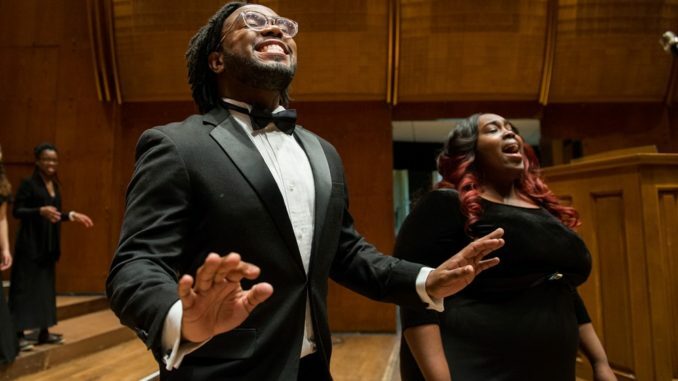 A program of classical, contemporary, jazz, gospel and sacred music will showcase the extraordinary talent of Nyack’s gifted singers and instrumentalists who are current students, alumni and faculty from the Rockland and New York City campuses. In addition to past performances at Carnegie Hall, Alice Tully Hall and David Geffen Hall (formerly Avery Fisher Hall), this biennial, one-night event delights the audience with music that displays the remarkable professionalism of these performers. Nyack students have the opportunity to hone their talent in School of Music groups such as the Chorale, Chamber Orchestra, Collegium Musicum, Gospel Ensemble, Jazz Ensemble, Musical Theatre Workshop, Early Music Ensemble and String Orchestra under the tutelage of faculty who are widely respected performing and recording artists. In addition to their regional travels in North America, Nyack students have performed in Italy, Paris, Poland, China, Korea, Hong Kong, Germany, Moscow and Puerto Rico. Don’t miss the opportunity to enjoy this unforgettable, uplifting evening in the heart of New York City. Information on ticket sales will be announced soon. Honoring the Life of Dr. Martin Luther King, Jr.